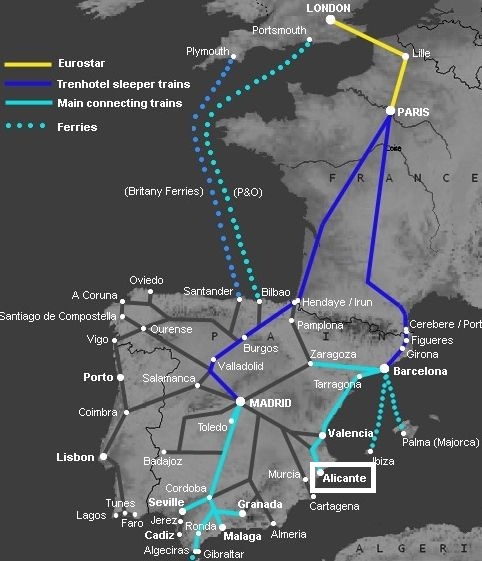 London-Paris-Barcelona-Alicante - It's easy to travel from London to Alicante without flying - you simply take an afternoon Eurostar to Paris, the excellent overnight 'trainhotel' from Paris to Barcelona, then a connecting high-speed 'EuroMed' train from Barcelona to Alicante. LONDON-PARIS Eurostar service from St Pancras station. Departing 16:55 (16:25 weekends) and arriving at Paris Gare du Nord at 20:17 (19:47 weekends). Fares: Adult £69 return; Youth (12-25) £59; Seniors & children (upto 12 & over 60) £49. PARIS-BARCELONA Trenhotel (hotel train) 'Joan Miro' 20:34 overnight service, in a 4-berth cabin. Fares: Adult £134 return; Youth, Seniors & children £99; 10-22% increase in summer. ALICANTE-FINAL To reach your final destination, upon arrival at Alicante mainline station, walk, taxi or take a number 21 or 22 bus (every 10 mins, 1 euros) 1 km to Alicante Mercado tram station. Trams, line 1, leave Mercado station every 30 minutes or so throughout the day for Benidorm, journey time 1 hour 9 minutes, fare 4.40 euros one-way. At Benidorm change to line 9, direction Denia, for the remaining 30-50 minute journey to Calpe, Benissa, Teulada (for Moraira), Gata de Gorgos (for Javea) and Denia. A taxi will take you to your villa: ranks nearby. You can find timetables & fares at fgvalicante.com. Alternatively, buses are available to Benidorm, and further, from just outside Alicante station.